During the past few days, parts of Southwest were taken over by masses of people due to all the events related to the Inauguration of President Barack Obama. I attended some of the events, namely the We Are One concert at the Lincoln Memorial and the swearing-in ceremony at the Capitol. Here are some photos I took during these events. 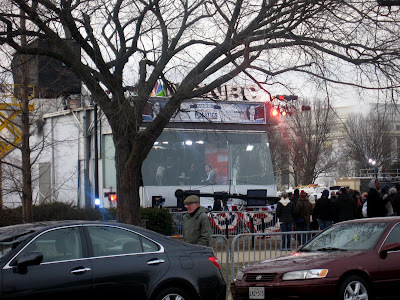 The MSNBC studio on the National Mall started broadcasting on Saturday, January 17th from 7th Street & Jefferson Drive. The studio has a window so passersby can see the broadcasters and guests, and it offers great views of the Capitol building from inside. The We Are One concert, which officially kicked off inaugural activities, was held at the Lincoln Memorial on Sunday. There were estimates by CNN that 750,000 people attended the free concert. I was standing east of 17th Street, which was outside of the security zone. Jumbotrons were installed so the large crowd could see the concert. Several streets north of the SE-SW freeway were closed to vehicles on Inauguration Day. 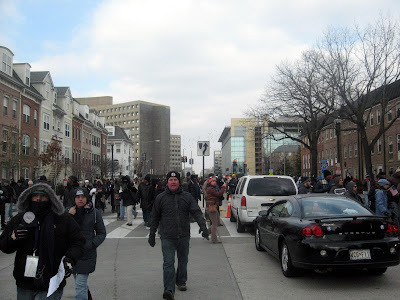 This photo was taken along D Street, in front of L'Enfant Plaza, where tour buses were parked and a crowd of people were trying to find their way to the Washington Monument around 10:30 AM, since by then the security zone at the National Mall was already closed. The WBJ reports that the L'Enfant Plaza Metro station was one of the more heavily used stations since it was one of the closest open stations to the Mall. According to a WMATA press release, January 20th broke the record for the amount of people who used Metrorail...1.12 million riders. 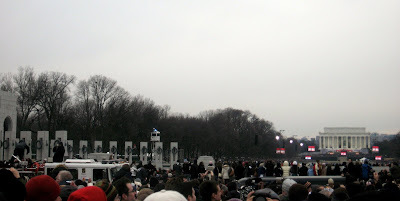 This photo was taken after the President gave his inaugural address and the crowd near the Washington Monument were leaving the National Mall. 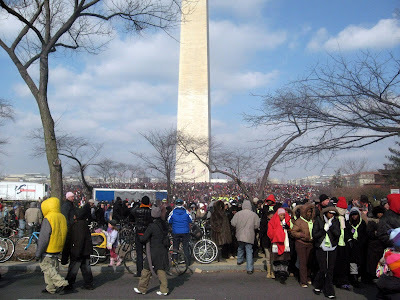 The Washington Post reports that an estimated 1.8 million people were gathered at the National Mall for the swearing-in ceremony, the largest crowd ever on the Mall. National Guard troops were stationed in several spots to help with crowd control. 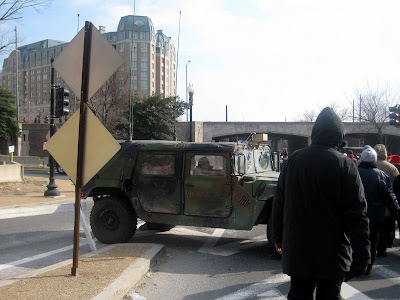 This Humvee was parked along Maine Avenue near the Mandarin Oriental Hotel. 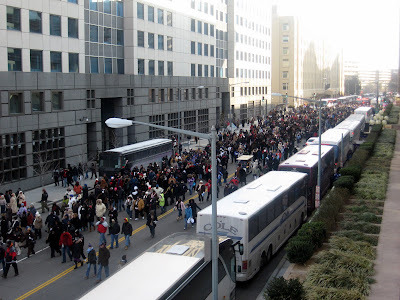 This photo was taken at the intersection of 7th Street and G Street looking north on 7th, as spectators from the swearing-in ceremony were making their way back to buses or other modes of transit. Visible in the background of this photo is the new facade of Constitution Center. Does the Southwest Waterfront Area Need a BID? If you are interested in advertisement opportunities, please contact SWill. The View at Waterfront Apts. All photos are taken by SWill unless otherwise stated and are the property of SWTLQTC LLC. If you want to use photos or content from this blog on another site, please give proper credit and provide a link to this site. Thank you.